Meet Rachel! Fashion student and Guest Blogger! Home/Blog/Meet Rachel! Fashion student and Guest Blogger! My name is Rachel Rexroth. I am nineteen years old born and raised in central Pennsylvania. I have a charismatic personality with a big heart and a dedicated mind. I am always smiling and am up for anything that is thrown at me. I get my perseverance from my dad and I am molded from my mom. God has blessed me with a close knit home and an array of friends. I choose to have a busy rather than sedentary life, and throw myself into my work and responsibilities. These are just a few things about me. I have a passion for fashion that has consumed my life like I’d never imagined it would; which is why attending Philadelphia University for a degree in fashion merchandising and management is so perfect for me. After my freshman year I have already gotten so much experience in the field; my first semester was spent creating my own company for my Global Fashion Insight class including creating, producing, marketing and selling a fashion product. Wanderlust, our fictional company, made faux leather bohemian-styled clutch bags. At the end of the semester we presented our products at a trade show and then sold them at the school’s pop-up shop. The experience was priceless! 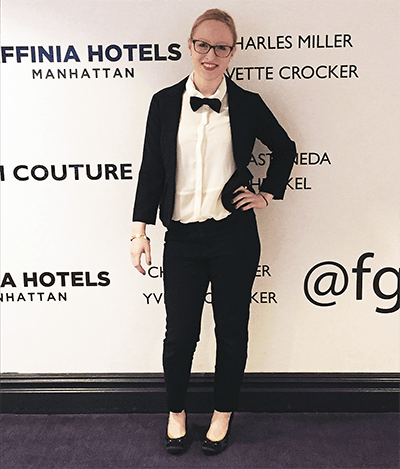 This past February, I attended New York Fashion week for three days, which was a dream come true for me. I was a backstage model dresser for two of the days and the other I spent being an usher seating guests and getting to watch the shows. I got to work with designers, models, impressive garments and an enthusiastic crew. We had long hours immersed in the craziness of the backstage atmosphere. It was a tiring but fulfilling experience and I will do it again this coming September. I stay submerged in fashion at my school by being involved with my school’s own annual fashion show and writing for the fashion publication Styleline. I blogged for Styleline, writing once weekly about a different fashion topic I chose from brainstormed ideas of the board members. I had always wanted to blog but didn’t know how to start one or what I would write about. From writing for Styleline and getting positive feedback from all my readers about how much they loved my pieces, I grew a love for fashion blogging. I have always enjoyed writing, so it is rewarding for me to get to combine my fondness for both fashion and journalism. My experience continues to grow as I received my full-time job and internship involving fashion this summer. I work full-time at thredUP, an online consignment store, in their warehouse as a merchandiser. I am also an intern for Tamzen’s Bridal at Butler Manor, a bridal boutique in Carlisle. I had never thought much about working in the bridal side of the fashion industry, but when I got this opportunity I had to jump at the chance to take it. It has already been a journey worthwhile for me, as the owner Tammy and her fiancé Robert have taken me under their wings and have treated me as if I were another business partner. I have gotten to see the ins and outs of this boutique, watching it come to life and transform into all that Tammy has envisioned. I have gotten to share my own ideas with them and they have graciously accepted them and used them along with their own ideas. I will be helping to host their grand opening day by putting together their mini bridal fashion show. I have helped Tammy pick out the gowns and helped her brainstorm ideas for inside the boutique and some of the technicalities of the business. Now I am helping the talented marketing team at Green T Design with Tamzen’s Bridal’s Facebook page and blog. I believe that Tamzen’s Bridal is going to be very successful as it holds the most perfect wedding gowns and the best team of business owners. I have been blessed with so many opportunities already in fashion and it only makes my determination stronger. Some do not understand what I do, some do not believe in what I do and some love what I do. I believe in my decision to be a part of the fast-paced, all-consuming, artistic world of fashion. I know I will go far doing what I enjoy. As they say, if you do what you love, you’ll never have to work a day in your life.